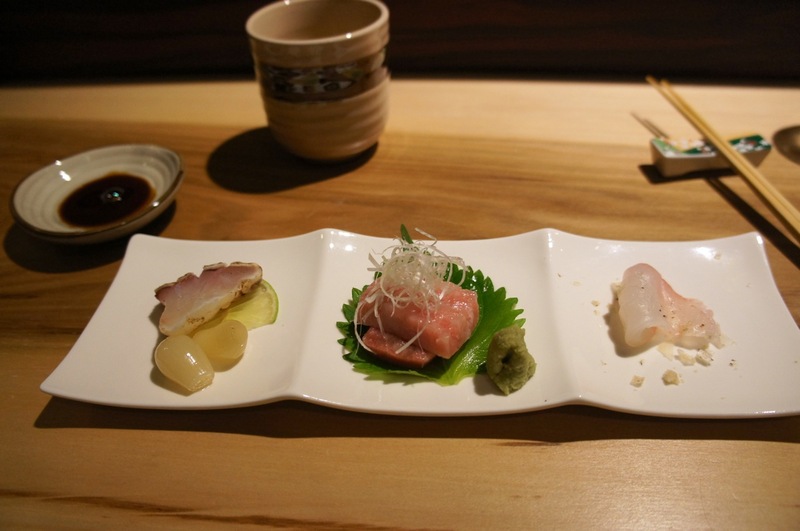 Omakase was one of my favourite way to savour Japanese cuisine. Your culinary fate for the evening is left to the chef – his whims and fancies, or more likely, whatever is left is the freezer. 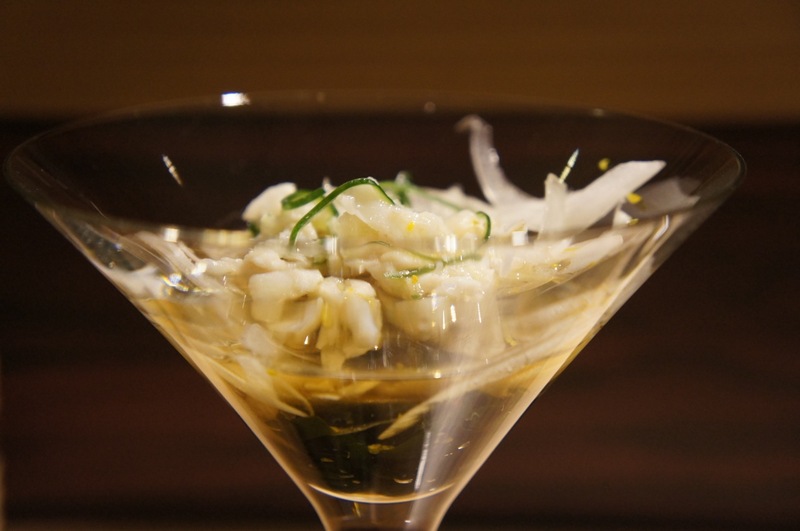 My favourite Omakase chef, Chef Watanabe, returns with a new restaurant in Boat Quay called E Pachi – a wordplay on his previous restaurant, the Hachi. While Hachi was named after the number in the address, E Pachi stands for the one and only Hachi (or it seemed). I heard that Watanabe-san had a disagreement with the previous partners, and decided to go on his own once more. I was looking forward to the opening of this new venture since the last time I went to Hachi and learnt that he was gone. The dinner started with an amuse brouche of Grouper in Vinegar and a trio of starters. Grouper was bit over cooked and was obviously from a very large fish so the flesh was not as tender as the medium sized ones. 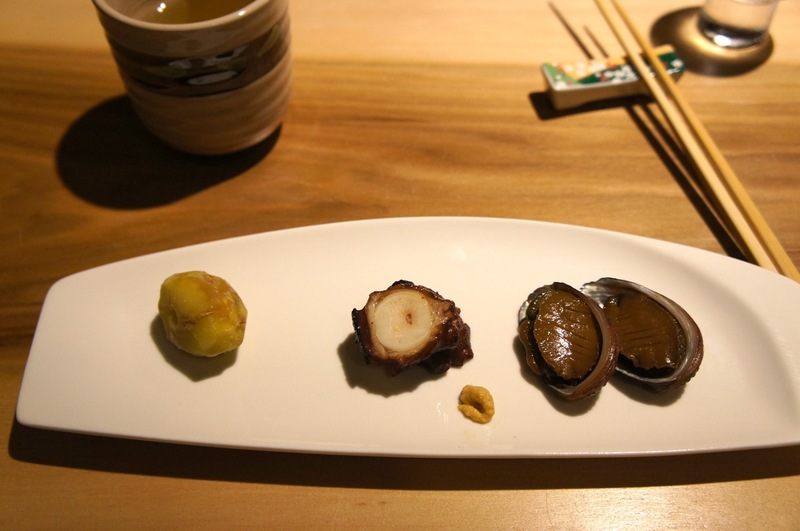 The appetiser featured seasonal items like grilled chestnut, octopus and baby abalone. 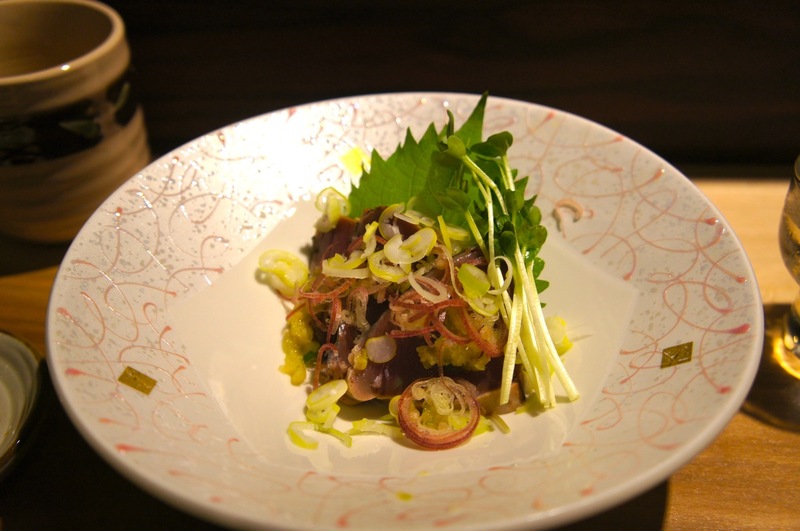 Each item was done in a different technique, with the chestnut grilled like 天津栗子, the octopus broiled in a sweet soy sauce and the baby abalone. This was followed by 3 type of sashimi – a flame-torched grouper (suspected it was the same fish) with a light brush of soy sauce, otoro (fatty tuna), and a light hamachi with sea salt. Nothing outstanding as the combination of these fishes did not give any synergistic kick or flavour, but they are all fresh though. 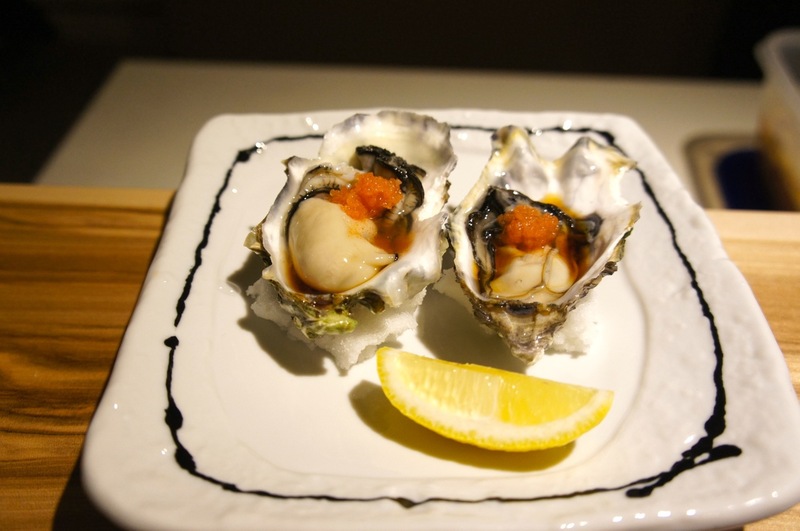 Here’s one dish that has Watanabe-san’s signature all over it – a simple fresh ingredient (fresh Hokkaido oyster) with a complex taste (ponzu with spicy grated radish with lemon zest). In this restaurant, he has 3 more chefs helping him (he had one in Hachi), and therefore this was made by one of his assistant . Firstly the size of the oysters were disappointing. Secondly, he forgot the zest. After all the fresh and light dishes, the marinated squid brought us to the next series of dishes. The soup was the grouper fish again. This was the third dish featuring the same ingredient. Jo jokingly said to the chef if that’s because there were no more ingredients in the freezer, and to our surprise, he said it was true. The best days to go are Tuesday and Friday, when the freezers are newly stocked. We went on Sunday, so it was wiped out by the Saturday crowd. 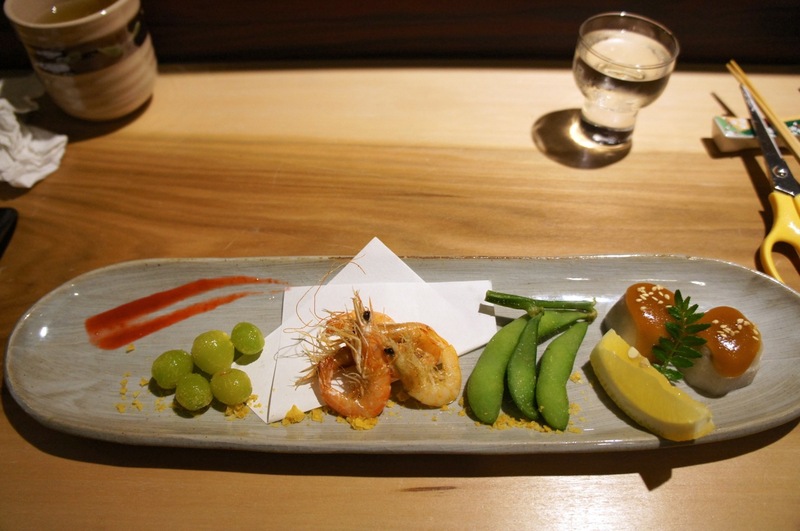 Before the meat, we were given a treat of grilled gingko nuts (very tasty), deep fried shrimps, edamame and taro with miso paste. Again, the additional hands that Watanabe-san have now really showed in the dishes. 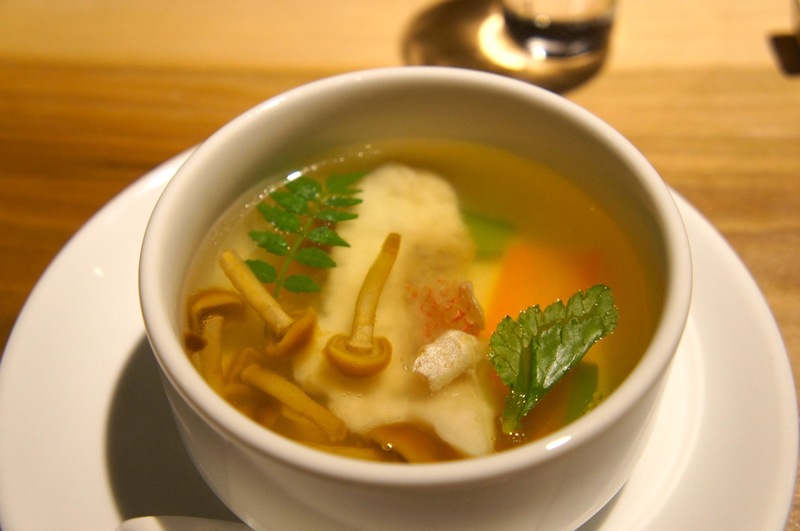 Imagine four techniques in one dish – representing the seasons. 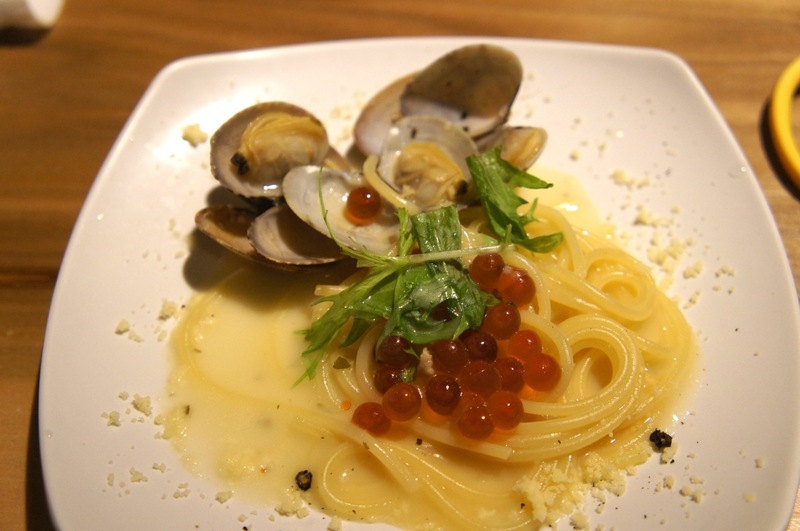 The first of the 2 starch, a spaghetti with ebiko and clams. which is my daughters favourite. 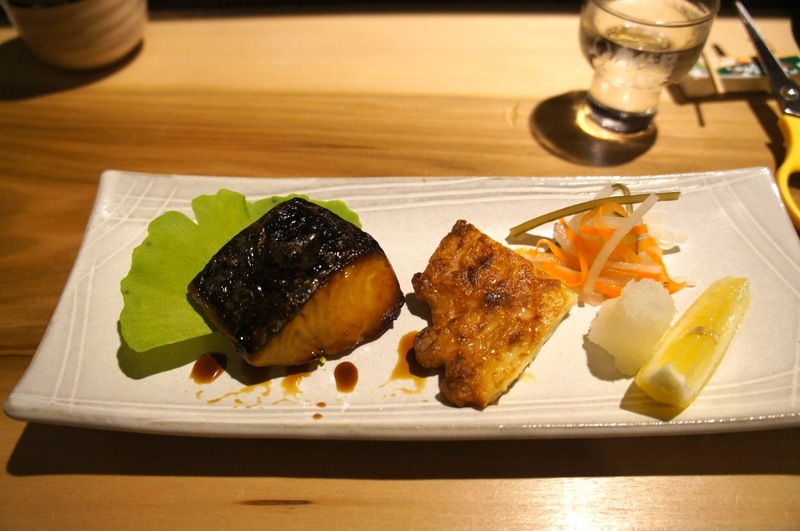 Hey, fourth appearance of the grouper fish grilled with a teriyaki sauce. 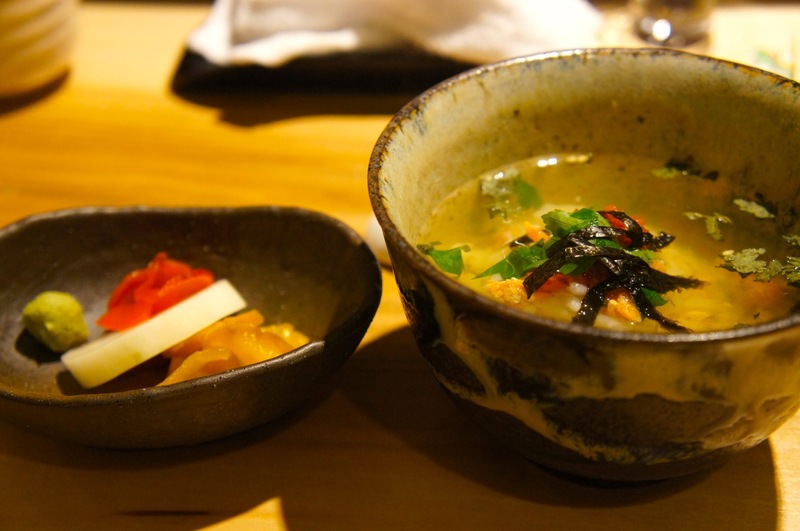 This is accompanied with a Japanese fish cake. This was the only one dish that has disappointed that evening. 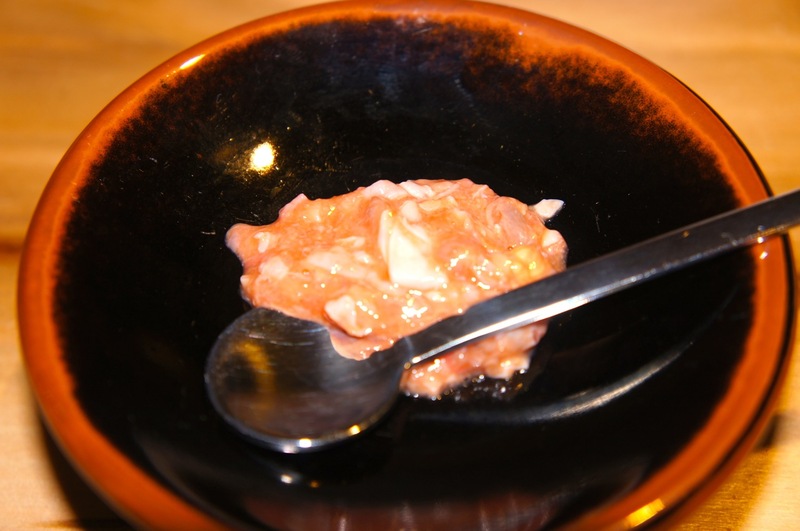 Tuna with scallions and leeks with a ponzu sauce – that taste has been repeated again that evening, and 3 fish in a row? 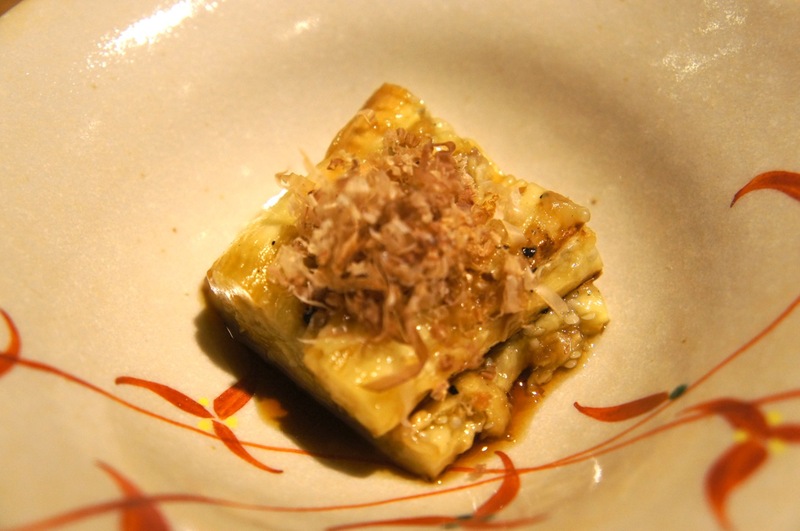 Before the meat, a well prepared grilled eggplant with bonito flakes was served to cleansed the mouth to prepare for the full flavour of Waygu. 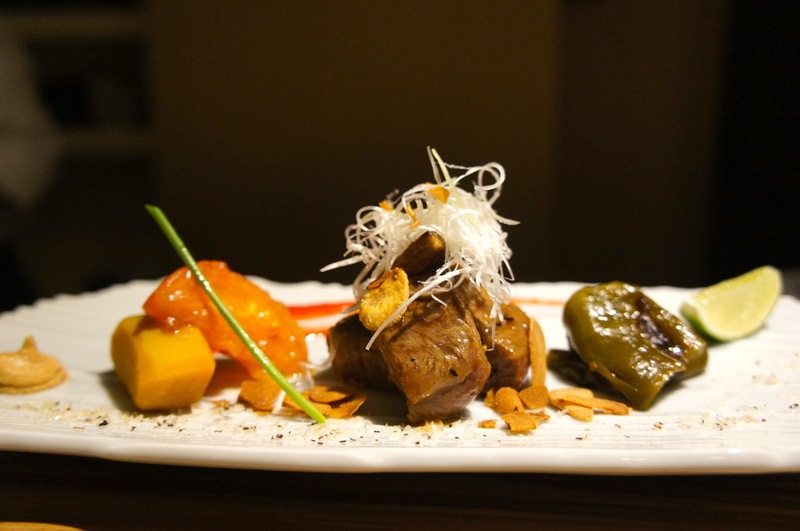 Left to right, pumpkin, Waygu beef, jalapeño pepper. Sweet, savoury, tangy and spicy. Warm, hot, cold. 3 items with 3 contrasting taste, temperature, texture. So depending on the combination you partake, each mouthful was different. The starch to round up the evening was a boiled rice with marinated ebiko and pickles. Frankly, I was not used to have sour boiled rice. We had a choice of ice cream, but we asked for fruits. No need for artificial sugar in the body. So Watanabe-san emptied his fridge and brought out Japanese apples. The place was just opened for 2 weeks, so they need a bit more time for the ingredients to arrive and for the team to gel. Looking forward to another visit. Service: Good, attentive. Food: Very Good 4/5. Ambiance: Ground floor 3.5/5, Upper floor 4/5. Price: $150++ for the full omakase, excluding sake. A la carte available as well.